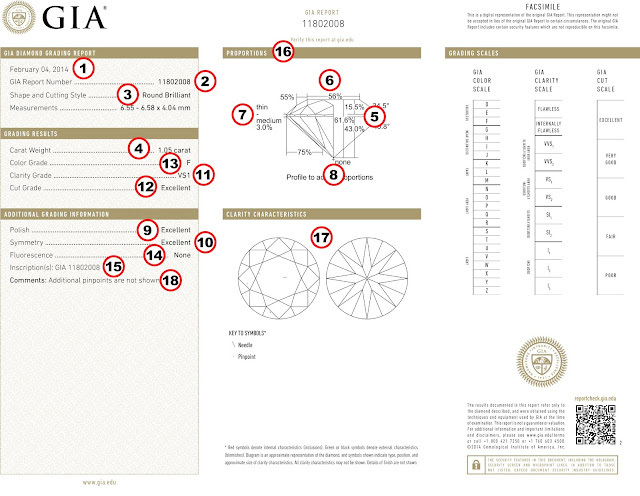 Knowing the defining categories used by the GIA to grade loose diamonds can help you to understand a GIA certificate. Here is an outline of the GIA grading categories and a few tips you can use to shop for loose diamonds and engagement rings. This is the date of the evaluation. Most wholesale diamond sellers sell diamonds with recent evaluations. The report number is a unique number that is assigned to both the diamond and the report. This one is obvious; it’s the shape of the graded diamond. This is the carat weight of the diamond. A diamond with a low depth percentage will appear larger when viewed from above. A larger table percentage means the diamond’s crown is low or shallow. Diamonds that have a very large table may be brighter than other diamonds, but they will appear to have less fire. This the outer edge of the diamond. It’s where the top of the diamond meets the bottom. A thin girdle can cause a diamond to be susceptible to chipping. When shopping for loose diamonds to set in an engagement ring, it’s best to look for diamonds that have thicker girdles. This is the pointed or faceted area at the bottom of a diamond. If the culet is too large, it will allow light entering from the crown to pass straight through it. This can reduce the brilliance of the diamond. This is a grading system that ranges from excellent to poor. The polish grade reflects the degree of smoothness of each facet of a diamond. Poor symmetry can misdirect the light traveling into a diamond. This can send the light to the wrong angles, which reduces the brilliance of a diamond. This refers to the degree of imperfections that are present in a diamond. These are measured by using a scale ranging from flawless to I3. A grade of I3 denotes major flaws and should be avoided. The cut refers to the diamond’s symmetry, proportion and polish. The beauty of a diamond depends more on the cut than any other factor. Diamonds are available in a variety of colors such as pink, blue and yellow. However, most people shopping for engagement rings desire white diamonds, and the presence of a yellow tinge lowers the value of a diamond. This refers to a diamond’s soft colored glow when subjected to ultraviolet light. This inscription denotes numbers on the diamond’s girdle for identification purposes. This is a diagram of the actual proportions of the diamond. A diamond plot is a graphic representation of each flaw that affects the diamond’s clarity grade. This area is used to note characteristics of a diamond that may not be covered on the certificate. To find a wholesale diamond seller that uses GIA certified diamonds near you, use your search engine. For instance, if you live in Los Angeles, enter the term “certified diamonds Los Angeles” into the search bar. Additionally, it’s helpful to read consumer reviews on wholesale diamond sellers. Yelp has an excellent website, which provides a good platform for reviews. This can go a long way to help you to find a GIA certified diamond that meets your specific requirements.